Ukrainian League 2015/16. Round 21. April 10, 2016. Dnipropetrovsk. Meteor stadium. 21 oC. In the game against Stal, which was held in Dnipropetrovsk at the stadium of Meteor, the Pitmen’s starting line-up has not undergone any major changes after Thursday’s Europa League game. At the same time, the defensive third was optimum, while in the holding area Taras Stepanenko’s pairing was Dentinho. 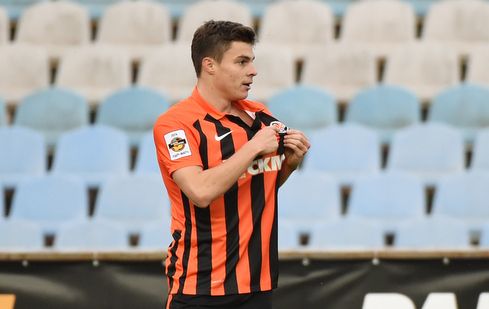 Taison was missing, so Bernard appeared from the off, with Oleksandr Gladkyy spearheading the side’s attacks. The team captain Darijo Srna made his 485th appearance for Shakhtar, thus repeating the record of Mikhail Sokolovskiy. The game began at a leisurely pace. The first dangerous chance came in the 7th minute near Shakhtar goal, after which the Pitmen rarely came near the box of the nominal hosts. Donetsk seized the initiative, carried out a variety of attacks, were close to success, only missing a finishing touch. On 38 minutes, a quick attack by Stal led to a goal: Kalenchuk responded to the diagonal right-hand pass into the box, got away from Ismaily and hit the far top corner to make it 1-0. Before the break, Shakhtar could equalise, but a Marlos shot off the pitch surface was parried away by Dniprodzerzhynsk goalkeeper with great difficulty. At half-time, Shakhtar line-up undergone just two changes, with Maksym Malyshev and Eduardo taking to the pitch. 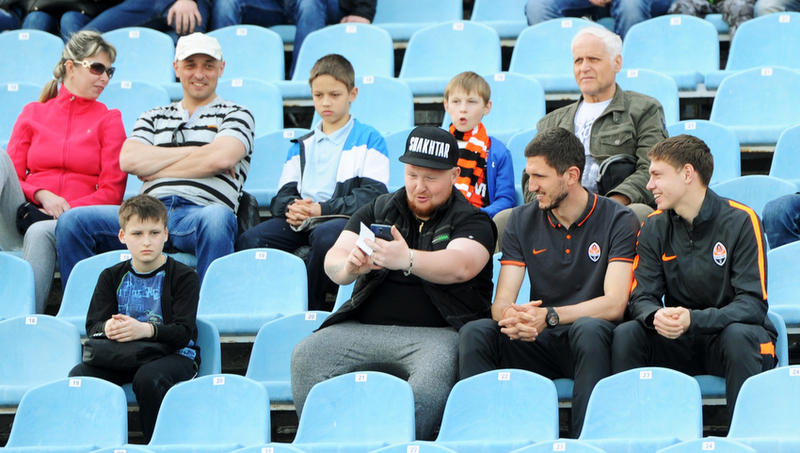 The best sub player of the league scored within six minutes of his presence on the pitch: Stepanenko ran down the left flank and crossed it to Marlos, whose shot was blocked, with the ball bouncing off to Eduardo, who just fired it home – 1-1. The Pitmen locked the hosts in their half. It seemed that scoring a goal was just a matter of time, but the ball flew into the back of the net of the opposite goal. On 61 minutes, Stal succeeded at fulfilling a counterattack when Lazic ran with the ball, penetrated the penalty area and sent it into the near corner – 2-1. While Donetsk were coming to their senses, Lazic dangerously threatened the goal, firing a header. Immediately Eduardo could equalize, but the opposition goalkeeper at the last minute took the ball away from the striker’s feet, who was about to find the back of the unguarded net. Soon, a goal by Eduardo was ruled out due to the latter’s being offside, with the Pitmen scoring two similar goals. On both occasions,Stepanenko assisted: first in the course of a massive attack, Taras lobbed it towards the far post right on Dentinho’s head, and on 79 minutes, he passed it into the box to Malyshev, who beautifully headed it into the back of the net – 2-3. The Pitmen tried to build on this success, but in injury time the hosts stepped it up suddenly and managed to escape from defeat, with the defender Ishchenko striking it goalwards from beyond the penalty area – 3-3. The Pitmen just did not have any time left to net a winning goal. Shakhtar will play their next game against Braga in Lviv on April 14, as part of the UEFA Europa League.